The RADIOFUNKEN Label caused for decades collectors on both sides of the Atlantic headaches. The similarity with the Telefunken record is more than striking. 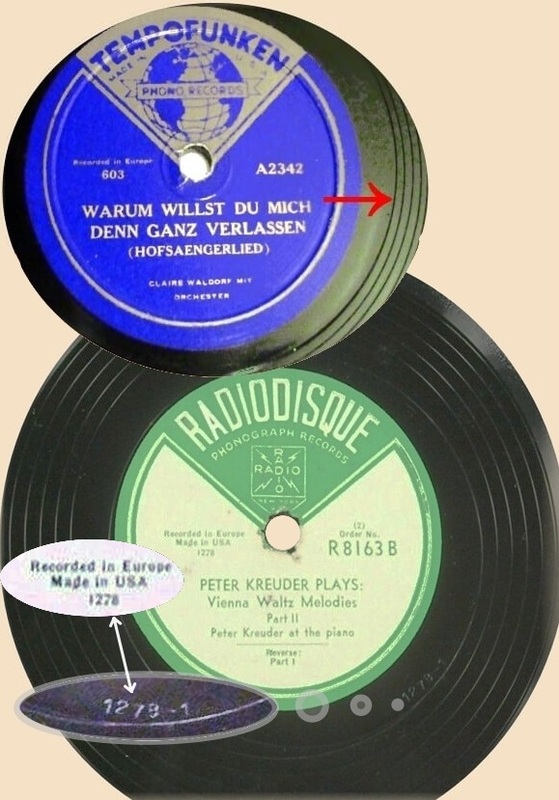 The Label appeared around 1940/42 in the US, recordings came almost exclusively from the Telefunken Label, Berlin, starting with recordings from the year 1932 on. Also a remarkable number of marches and Nazi related content appeared on this label. 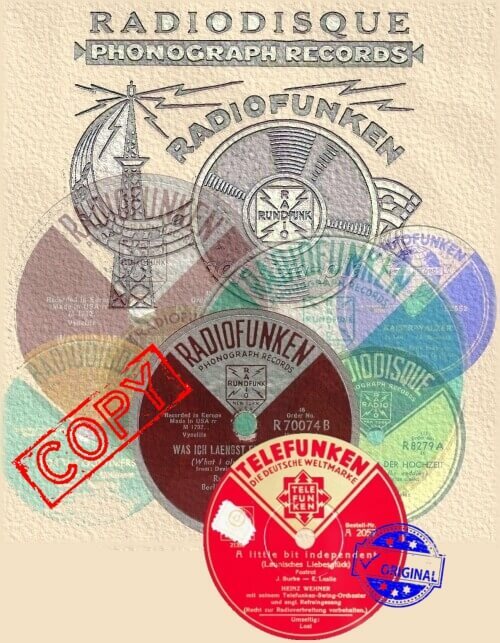 Many collectors belief that Radiofunken is a export brand of Telefunken. However, this is wrong. These are all pirate dubbings from commercial Telefunken records. 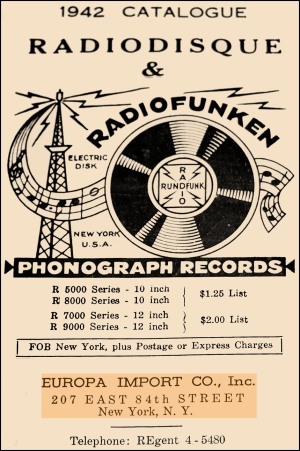 The actual manufacturer (and counterfeiter) is already denoted on the label: The Radio Rundfunk Corp. New York (Radio Broadcasting Corp. New York). 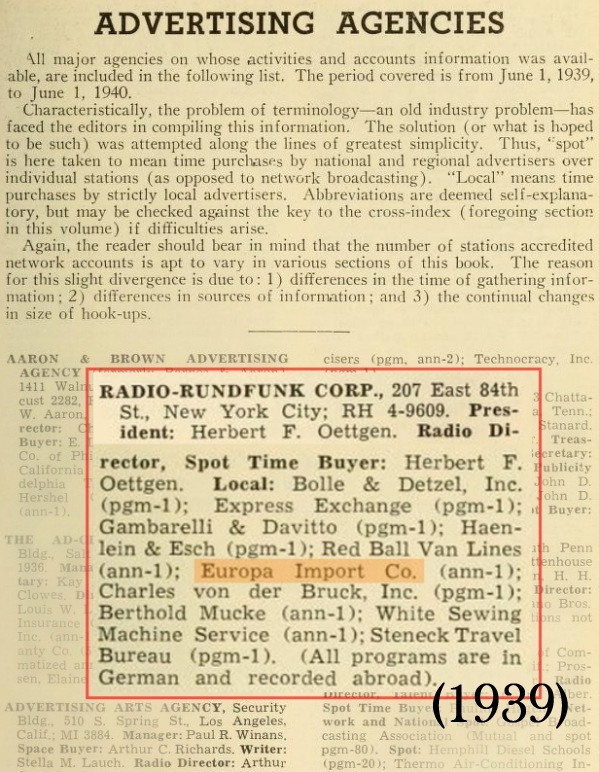 Telefunken even had a claim against RADIOFUNKEN in 1943! But who is behind this company, if not the German Telefunken? To say it „carefully“ - American "Nazi sympathizers" and German immigrants of the 1930s and 40s. Born in Saxony in 1905 Herbert Oetggen came 1927 (probably for the first time) to New York. Profession according to the files: None… After further trips, in 1931 even to India, he found himself from around 1933 on employed in German Radio Hours in New York. The programs had been funded by the German furniture store „Bolle & Detzel“ in New York. In 1934 Oettgen had been fired from the first radio station – it was suspected he sympathized with the Nazis. He stayed with his weekly program in German at the station WBNX. Again financed by "Bolle & Detzel". 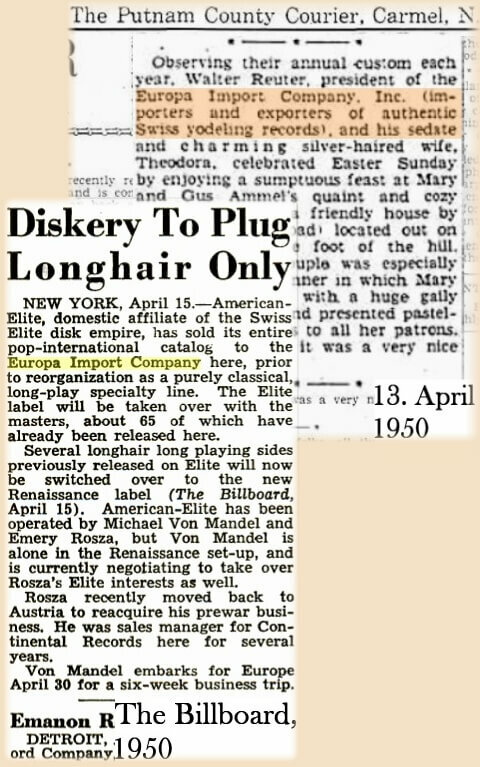 Around the same time the „Europa Import Co.“ had became active in New York. 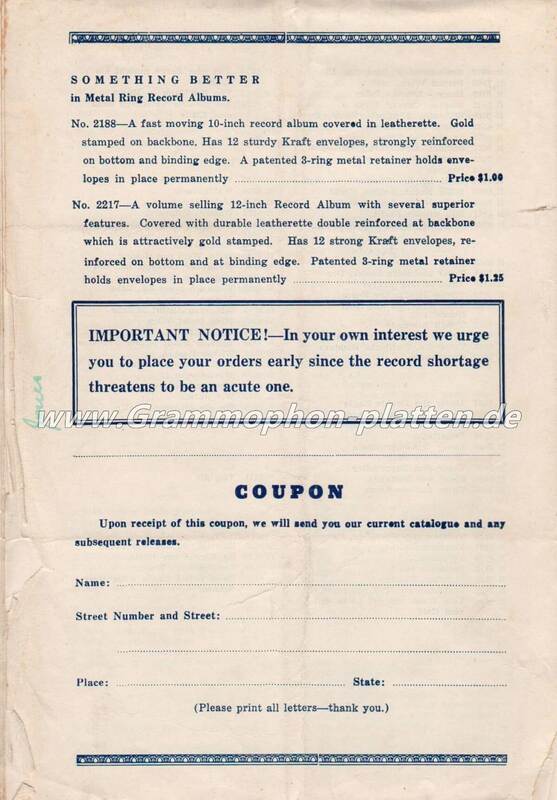 Besides postcards, cuckoo clocks and gingerbread, the company sold records from Germany – most probably pirate dubbings. 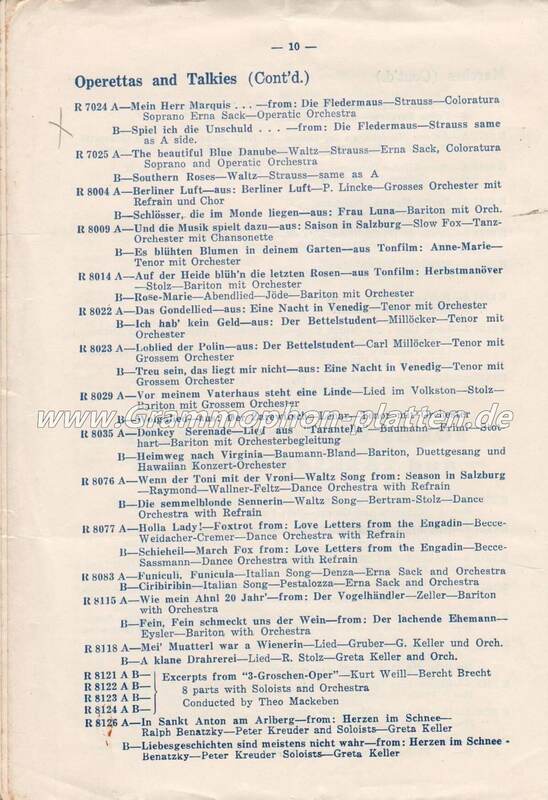 Both "Bolle & Detzel" and the „Europa Import Co.“ advertised regularly in the anti-Semitic agitation Newspaper „Deutscher Weckruf und Beobachter“ (German wake-up call and observer). Owners and employees of Bolle & Detzel are repeatedly arrested or interrogated in the short term due their political "activities". 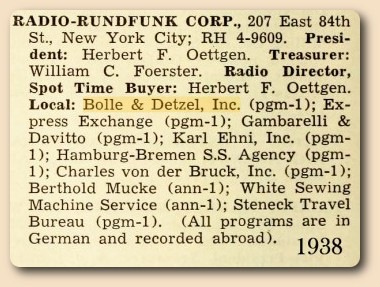 By 1935/36 Herbert Oettgen established the Radio Rundfunk Corp – he is also the "President" of the Corp. Apart from Bolle & Detzel also other German-born business owners from New York funded this company. In the "stable" of this Corporation is now also the Europa Import. In addition to the activity on radio Oettgen teached himself in Phono- Techniques. From the mid-30s on he regularly recorded with a mobile cutting system events and speeches of the BUND in New York. Besides this he also broadcasted dubbed speeches of Goebbels and Hitler over Station WBNX. Pressings of these dubbed records had been also offered to other Stations. Probably around this time he began to dub records of the German Telefunken - probably initially to play them with his German Radio Hour. 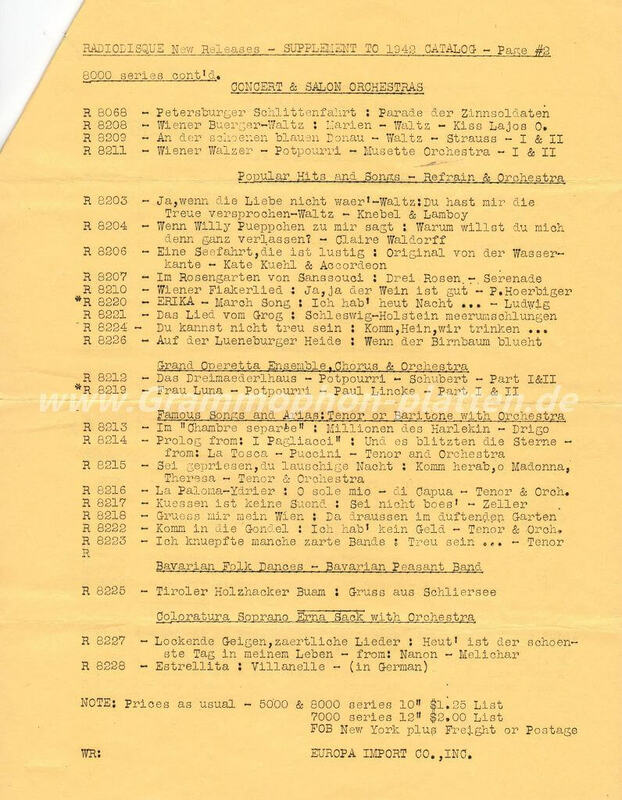 The dubbing of German Record and distribution of Nazi speeches became a increasingly lucrative "business side" of Oettgen, the "Radio Rundfunk Corp." and the "Europa Import Co.". It is not exactly clear when he started to sell the pirated copies of Telefunken Records to private customers. 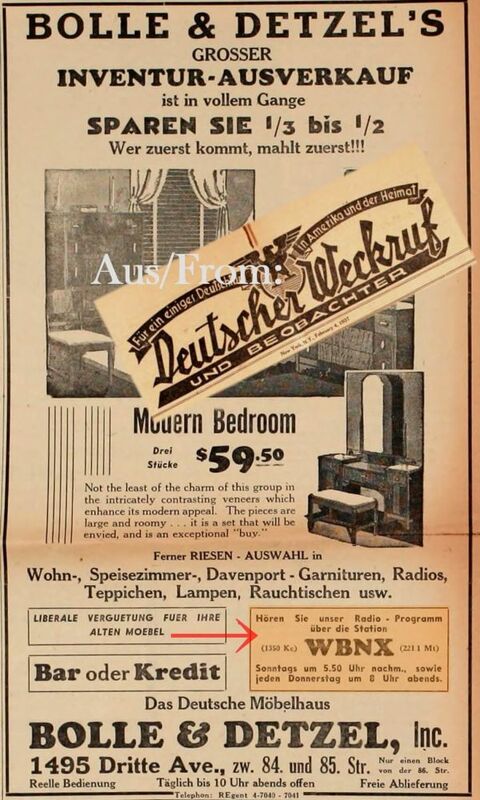 Maybe first the TEMPOFUNKEN, then the RADIOFUNKEN were "doorstep selling" but also sold through mail order. 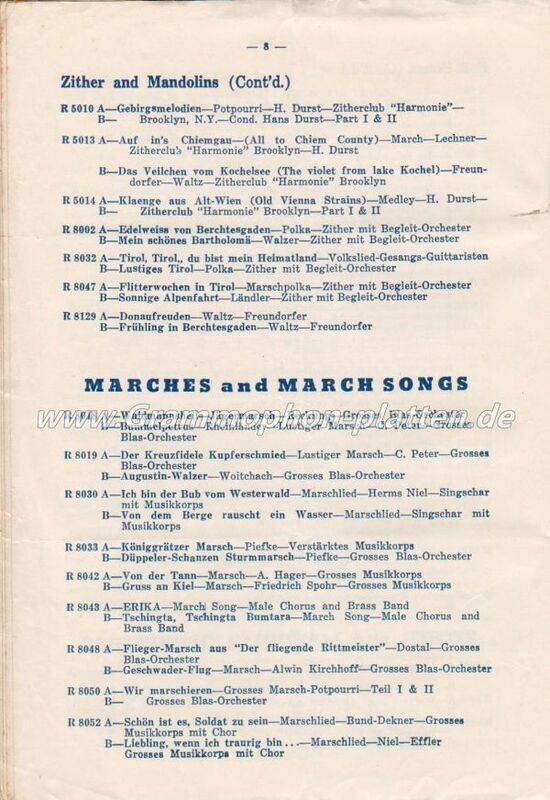 Whether the recorded speeches of Nazis from America and Germany, or even pieces like the "Horst Wessel Song" were advertised directly in the lists, is still unsettled. Maybe advertised through loose papers in the Catalogues or simply word-of-mouth advertising. It is still unclear how Oettgen and its funders got hands on the Telefunken Records from Germany. Both he, as well as more from this environment had traveled in the 30s to Europe and Germany. 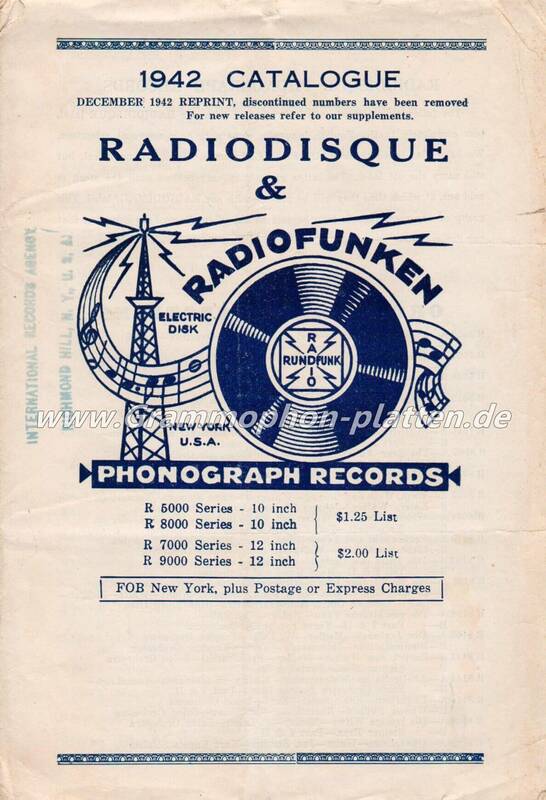 Also possible: partners from Germany sent commercial Telefunken records to New York. Oettgen made the dubbings. 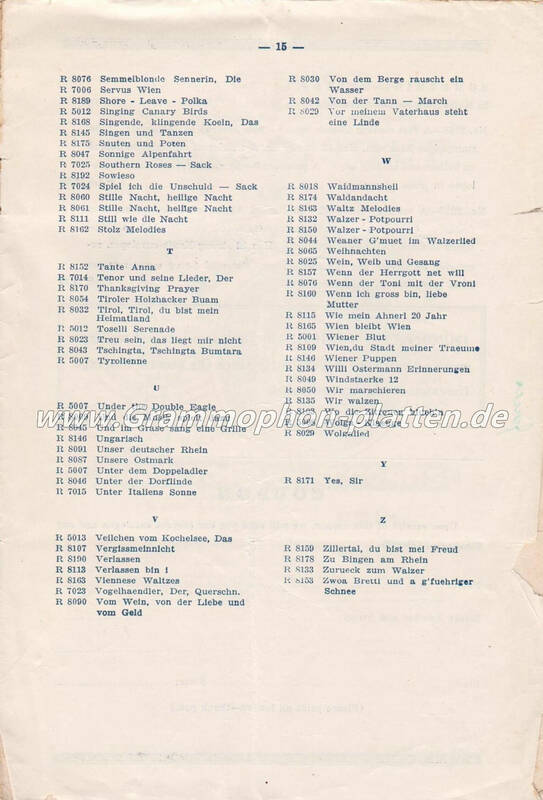 The catalog with pirated records on RADIOFUNKEN became more and more extensive. However, he recorded also zither and mandolin clubs and choral societies with German songs – “Lied” in New York, pressed and sold them on Radiofunken. 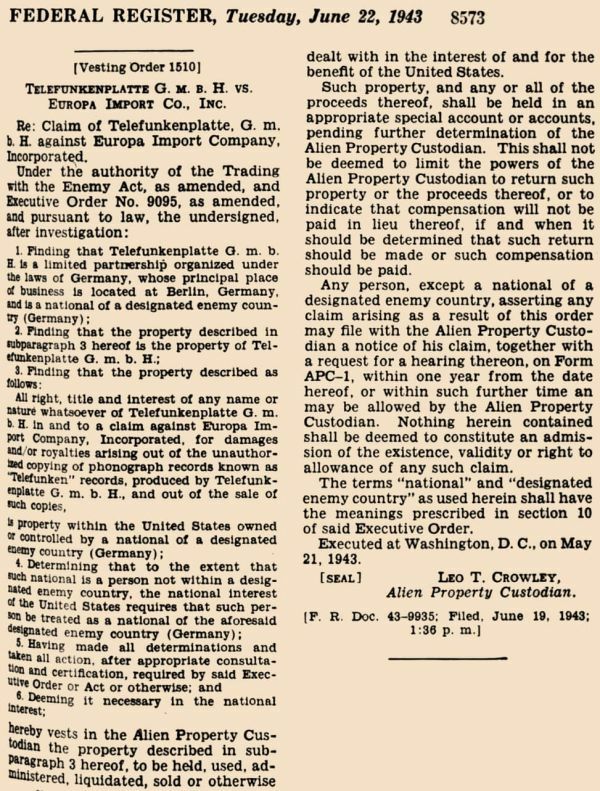 The distribution of the records and the settlement with the dealers took over the Europa Import Company. With the US entry into the war German broadcasting came again under keen observation. 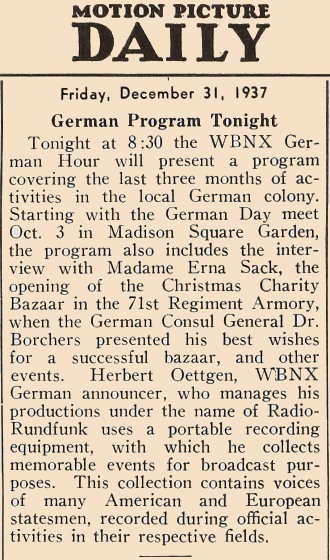 One of the first to “got of the Air” was Herbert Oettgen with his “German Hour” broadcasts, produced by the Radio Rundfunk Corp. and their business partners. Their approach now seems almost naive to us: After the attack on Pearl Harbor he still played in the program the "Horst Wessel Lied" and other Nazi speeches. 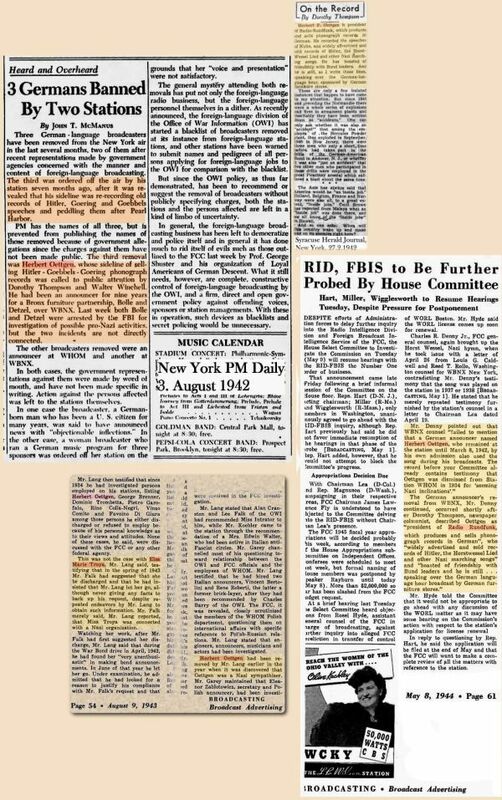 This led to another scandal now also echoed nationally in the American press. Oetggen went underground, two of his business partners were shortly arrested by the FBI. 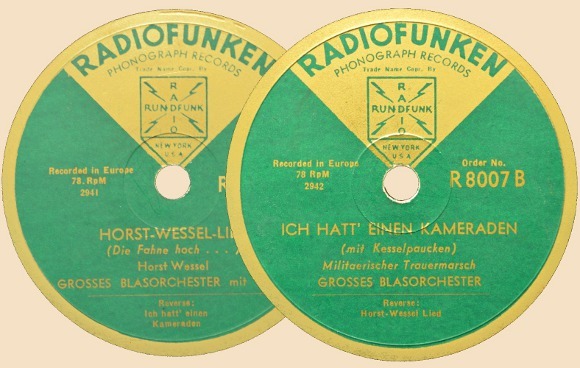 At first the distribution of RADIOFUNKEN records went on. Who from now on headed the Europa Import Co., which was the official distributor of the records, is still unclear. 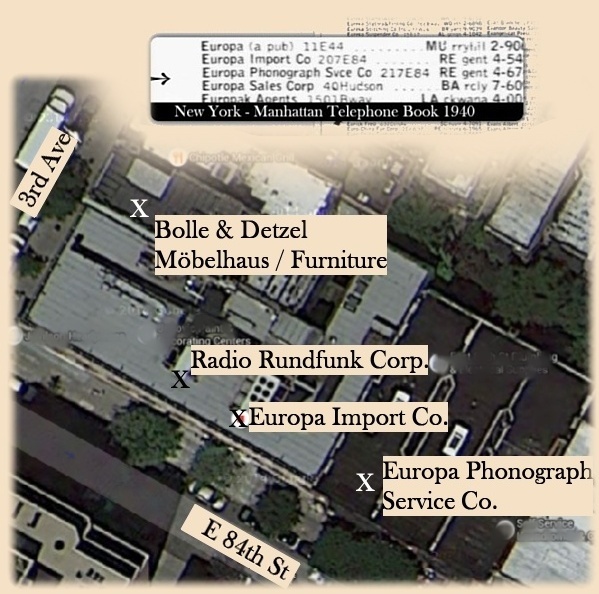 At least since 1939 the Radio Rundfunk Corp. and Europa Import Co. shared the same address: 207 East, 84th Street. At the end of 1942, the name of the Label was changed in RADIODISQUE. 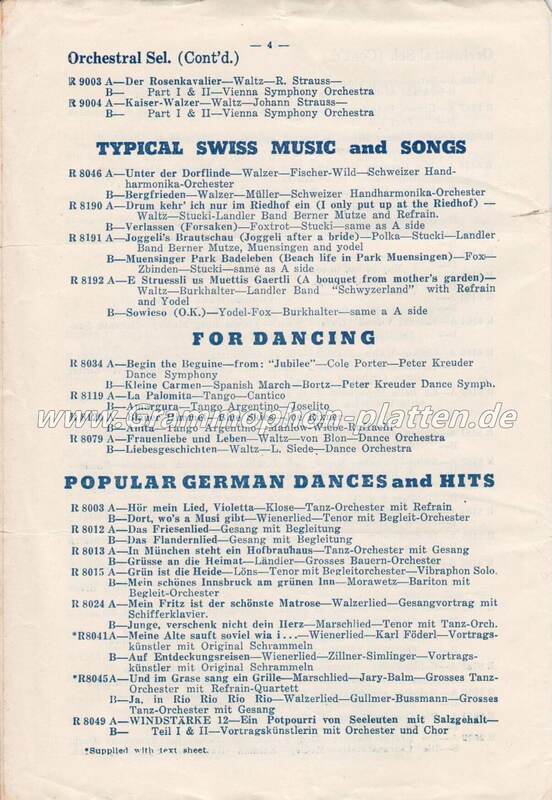 In the summer of 1943 it came to a court case against the Europa Import a.k.a Radiofunken / Radiodisque. Telefunken in Germany filed a lawsuit due to the pirated records in the USA. 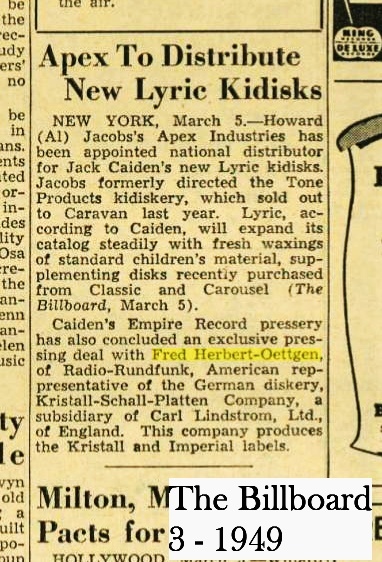 Probably soon after this trial, production of RADIOFUNKEN Records stopped. 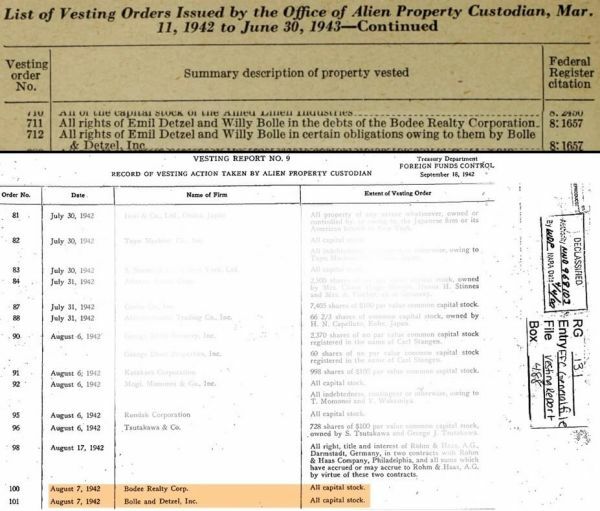 In 1945 none of the Radiofunk Corp. or Europa Import Co. can be found in the in the the yellow pages of New York. Here the Radio Rundfunk Corp. of Herbert Oettgen is called directly as a manufacturer. Production probably from c. 1940/41. Probably also an early label - variant. No indication of the mx-nr. on the label. 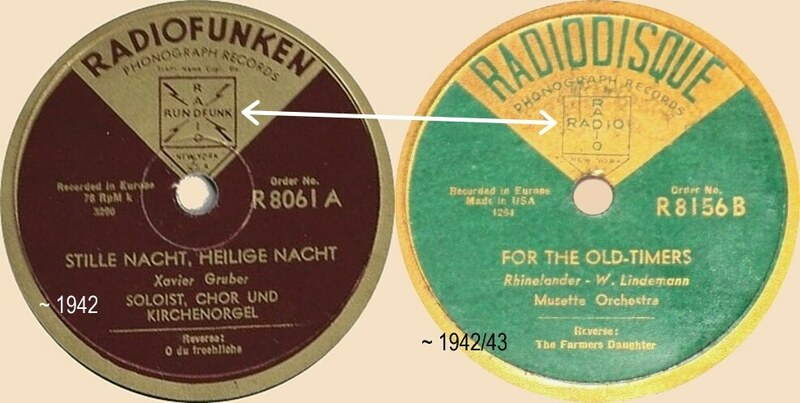 "Conversion" from Radiofunken to Radiodisque from 1942 on with the entry into the war. After end of the war Oettgen "reactivated" the Radio Rundfunk Corp. This label - variant is a post-war pressing. Another indication for the "pirated" records can be seen here - Telefunken never used such lead out grooves. They are part of the dubbing process from the commercial Telefunken record to a new wax master. You also see the mx. system used by Oettgen/Radiofunken as it shows a take number (-1). Because of the pure German lettering but also the low mx. 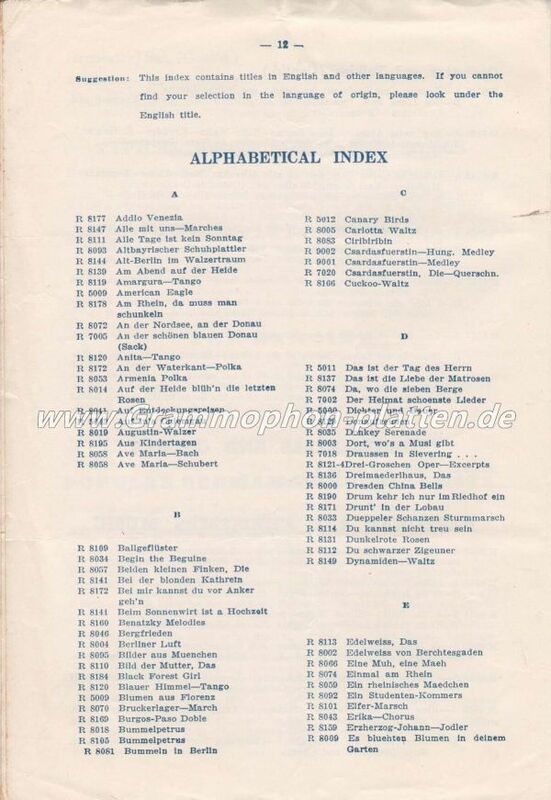 and order numbers seems to be TEMPOFUNKEN as the precursor of the later Radiofunken. 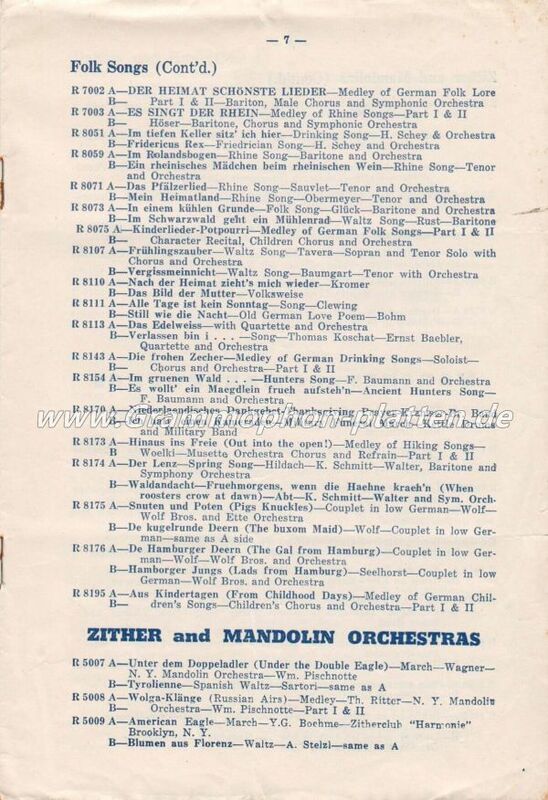 Right a rather early Radiofunken with a recording made in New York by the zither club “Harmonie”. Left: Label - Variant before 1942/43. Caption in German; Telefunken dubbing. Interesting detail: 78 rpm k. The letter K is only found with labels before 1945. 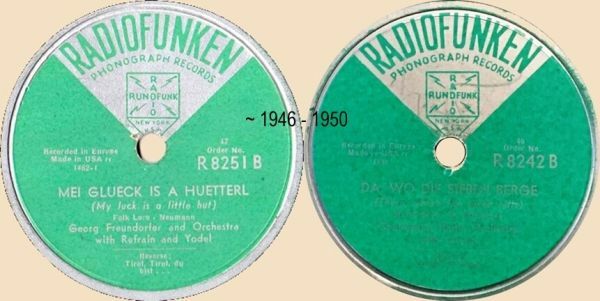 Right: From 1942-43 transition to Radiodisque. The order numbers are retained or moved on without interruption. Change of Radio - Rundfunk on the label to Radio - Radio. 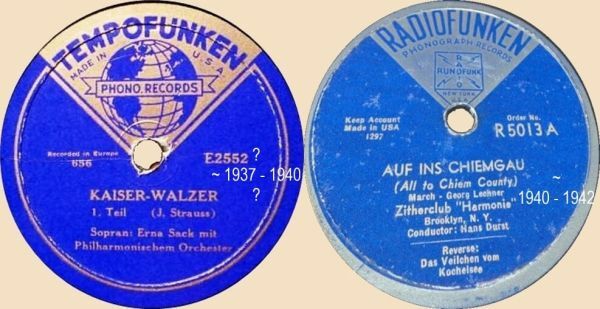 The claim of Telefunken against Europa Import Co. - Radiofunken may also a reason why the name of the record label changed from Radiofunken to Radiodisque. Later the label of Radiodisque is less intricately designed (glossy missing). Caption partly a mixture of German and English. DISCUS -. Made from, around or after 1946 by the Radio Rundfunk Corp - Herbert Oettgen. Own recordings from the USA, but also "old" Telefunken dubbings. The order no. 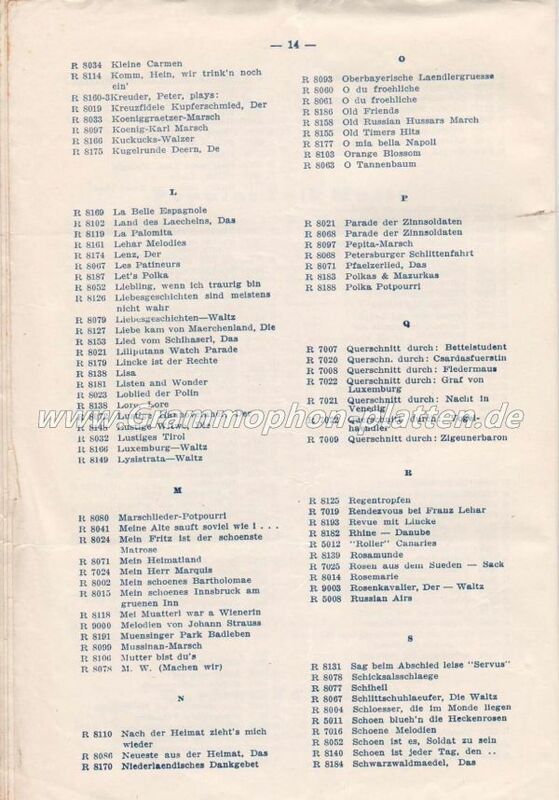 - Series 5000 suits the order number system of RADIOFUNKEN before 1945. 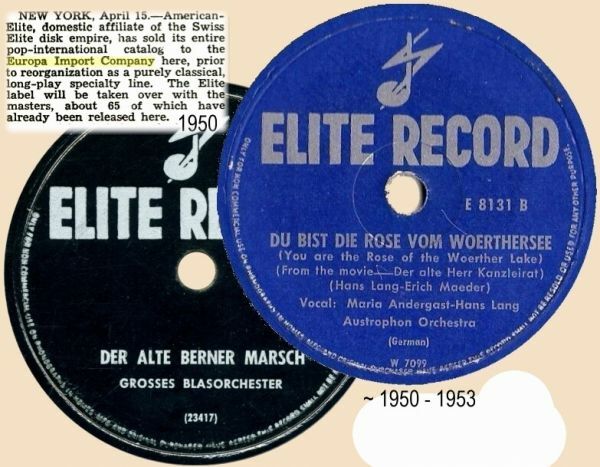 After 1950, DISCUS is manufactured by Empire Record, this company was also in connection with Oettgen. Now even "new" dubbings and / or matrices from European records. 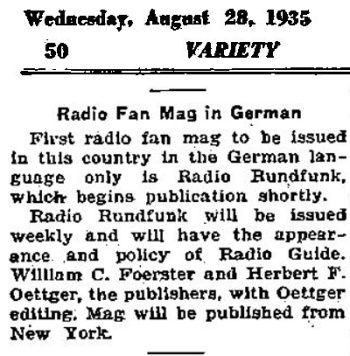 From c. 1946/47 Radiofunken appeared again. Use of “old” Telefunken dubbings. Detail: Made in USA rr. The k of the prewar series disappear now. rr is used on labels after 1945. 30 cm Radiofunken Records now also in red vinyl. On the label as Vynelite (Unbreakable). This red vinyl was first used in 1945 by the RCA Victor. A indication of the Victor as a reward pressing plant? Or the Carl Fischer studios…? The Europa Import Company is now under new management. 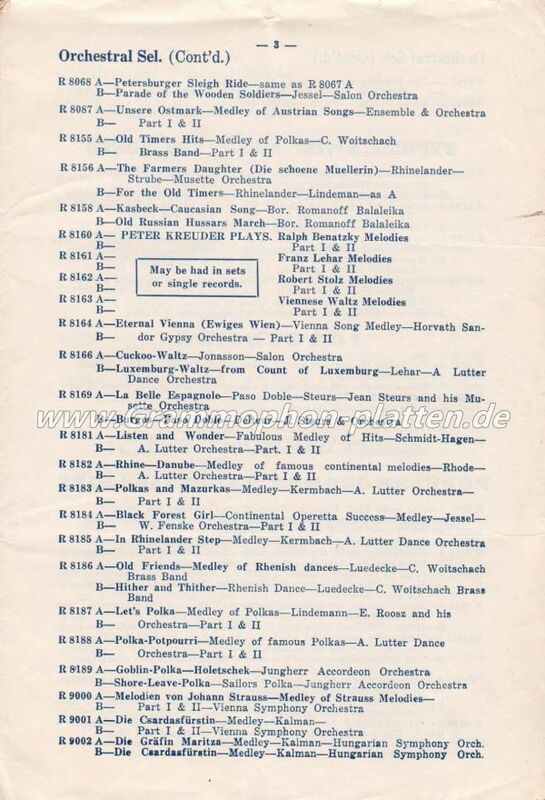 From 1950 on, they distributed recordings of ELITE from Europe.
? So far, only a few order numbers detected. Possibly using records from Vienna / Austria. Irony aside: While banned in Germany since 1933, Radiofunken still sold the complete "Threepenny Opera" series; originally recorded in 1930. for Ultraphon. Our entire story took place in Yorkville, NY - also known as "Little Germany". 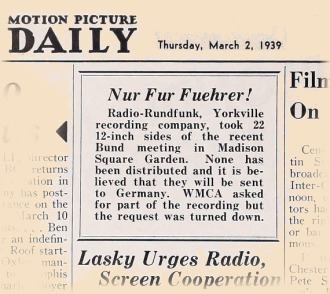 Both the "German - American - Bund", as well as Anton Haegele his Hetzblatt "wake-up call and German observers" tried to book airtime over New York radio stations - the stations refused. Apparently this got "Bolle & Detzel" and Herbert Oettgen into play. 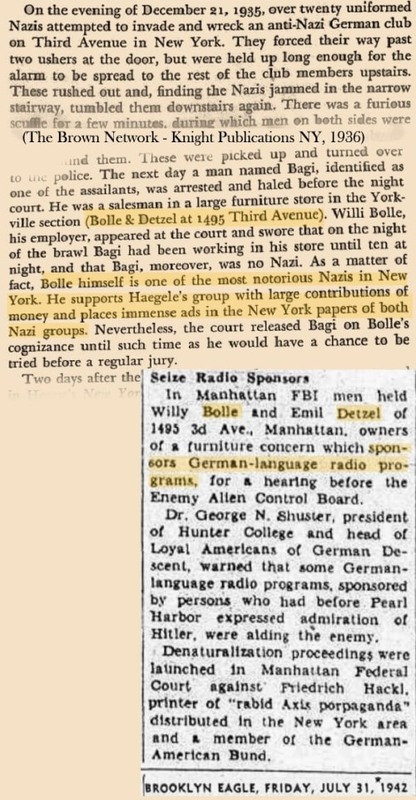 "Bolle & Detzel" led in the mid-30s in New York a large furniture store. However, this had been bought not until December 1933 - probably with foreign capital. Before, they were themselves actors in broadcasting. 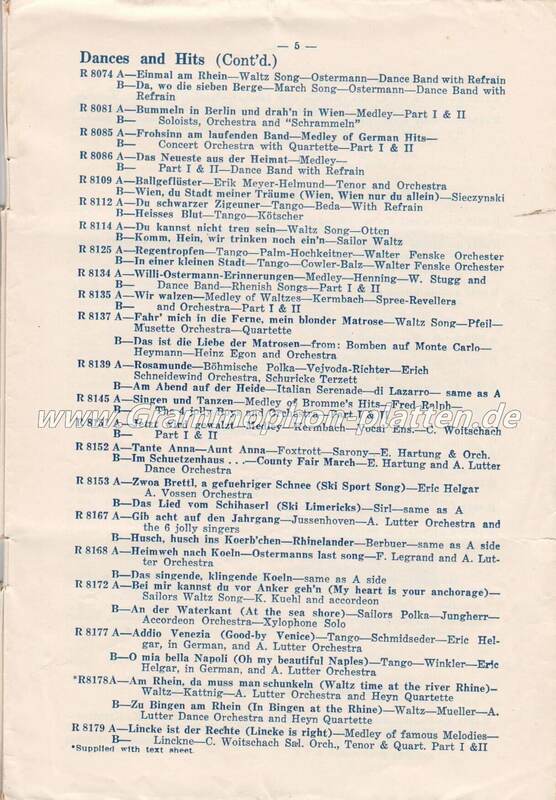 From 1934 on they have been the main funders of the programs led by Oettgen (Station WBNX). In addition, the furniture store and the Radio Rundfunk Corp. were direct neighbors, situated in the same block at the corner of 84th Street and 3rd Avenue. In 1935 they came into the headlines because one of the owners revealed crimes with Nazi background. 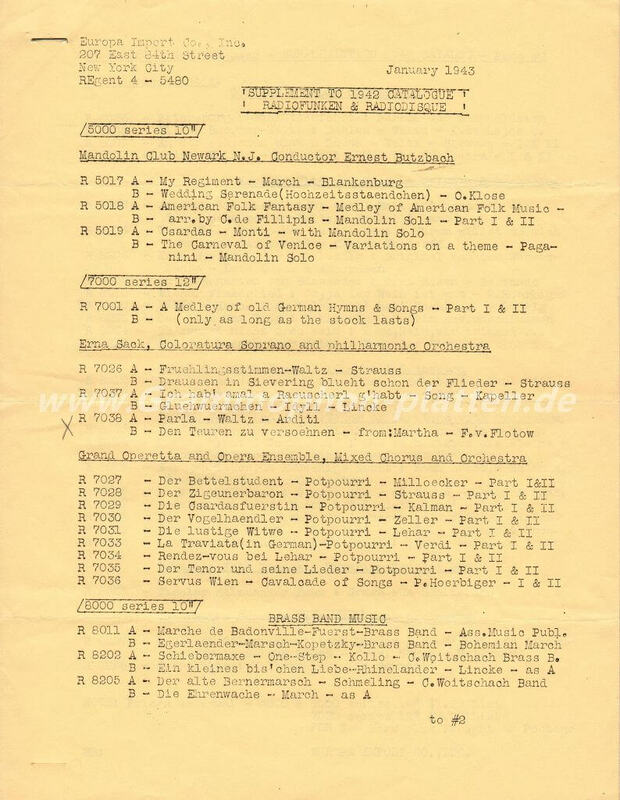 After a contemporary report Willy Bolle was a notorious Nazi, who once again supported the groups around Anton Haegele financially and through large Ads in his Hetzblatt. 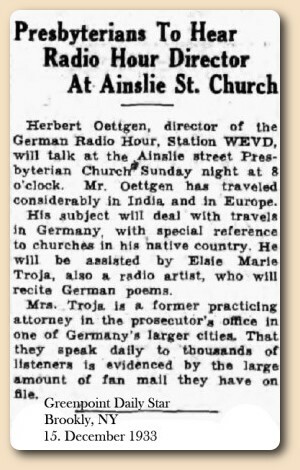 After the radio scandal around Oettgen in early 1942 Bolle and Detzel were temporarily detained and questioned by the FBI, but they were released shortly afterwards. In other words: "Access only for selected Arians" - or something similar... Afterwards Willy Bolle is lost in the fog of history. The Company "Bolle & Detzel" had been closed soon after. It is still uncertain when exactly Herbert Oettgen started with German-language broadcasts. 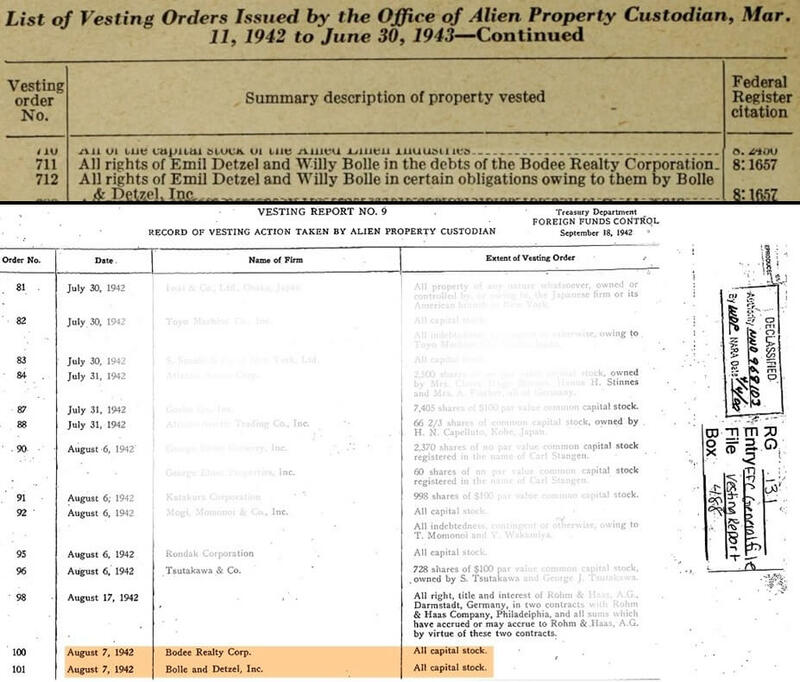 In 1930 Oettgen lived still as a lodger in NY. Upon his arrival in September 1931 he gave as profession "Merchant". He traveled again to Europe, arriving back in March 1932. Now he called the occupation "Vice - President". Within six months from a Merchant to a Vice-President; probably this “career” is in context with the broadcastings. 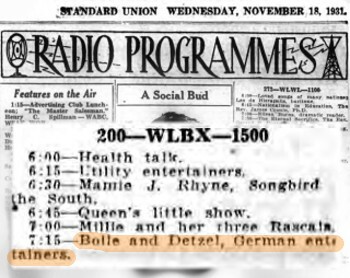 Bolle & Detzel also occurred in early 1933 still as radio entertainers. During the year 1933 (or earlier?) he became director of the "German Radio Hour" at New York's station WEVD. He could also been heard over the station WHOM. Early in 1934 he moved to the Station WBNX; employee WHOM had fired him because "National Socialist sympathies" had been suspected with him and his programs. 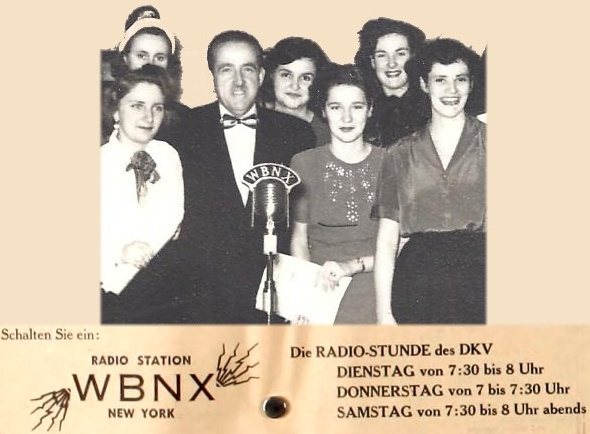 The station WBNX had specialized in foreign language programs for the polyglot population in New York. Already in start with the new station, first problems appeared . 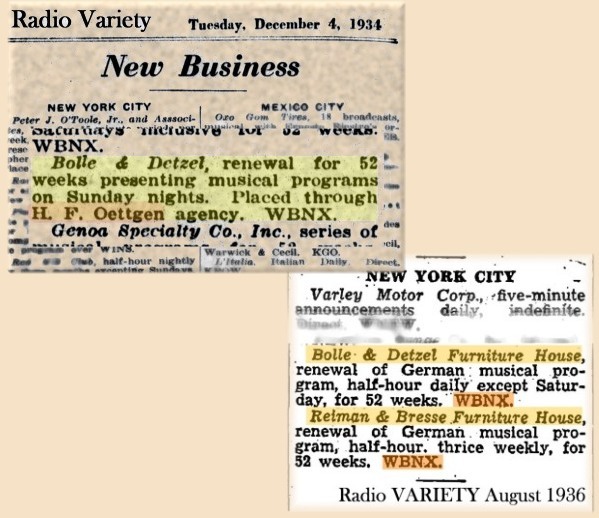 WBNX canceled in April 1934 a program which reported very critical about the political situation in Germany and Italy (the so-called "Berlin-Rome Axis"). Now the accusation was in the air, the station made room for Nazi - propaganda. 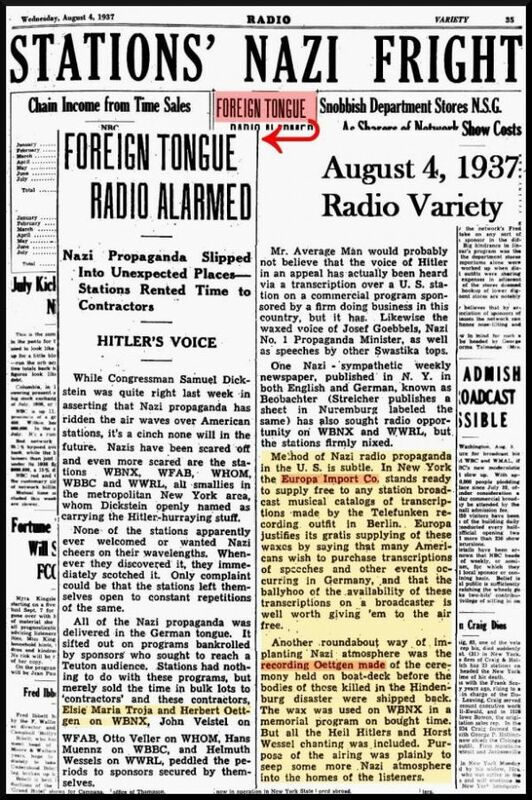 Edward Ervin, production manager of radio station WBNX, yesterday denied that his station had removed a program to make room for the broadcast of Nazi propaganda. Charges to this effect were made early this week by Theodore Nathan, of the magazine Debate. 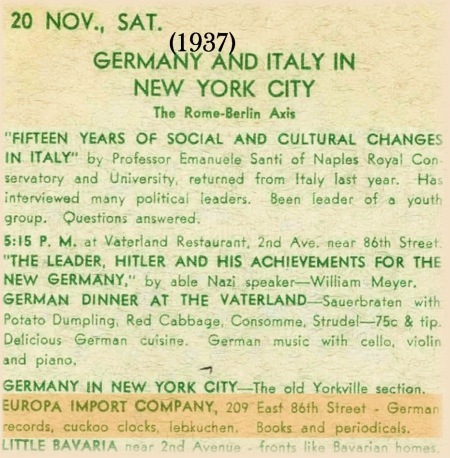 During a theme week in 1937 about life of German and Italian immigrants in New York, there are not only speeches by a "able Nazi - Speaker", Gemutlichkeit with sauerbraten and dumplings – there is also a visit of the Europa Import Company in Yorkville. 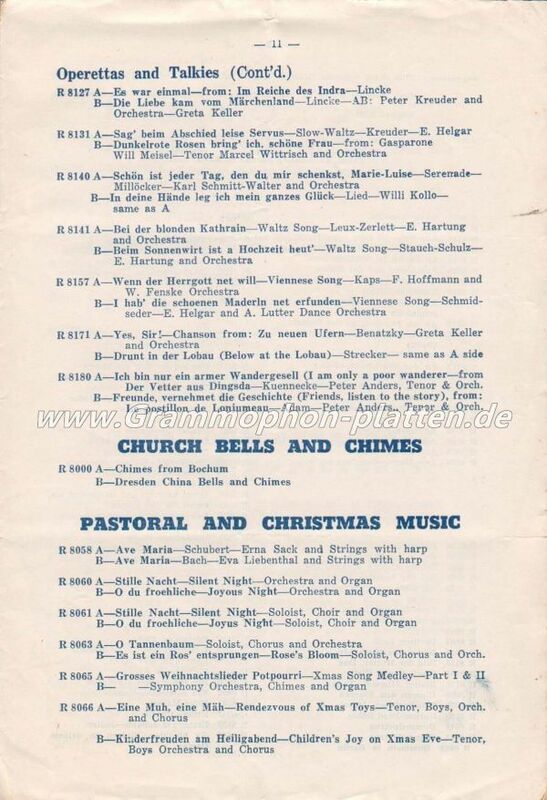 In addition to books and magazines, cuckoo clocks and gingerbread they also sold German records. TEMPOFUNKEN? At the latest from 1937/38 on the Radio – Rundfunk Corporation appeared. This is the company behind the radio broadcasts over Station WBNX. Director is Oettgen, the already known William Foerster finance director. 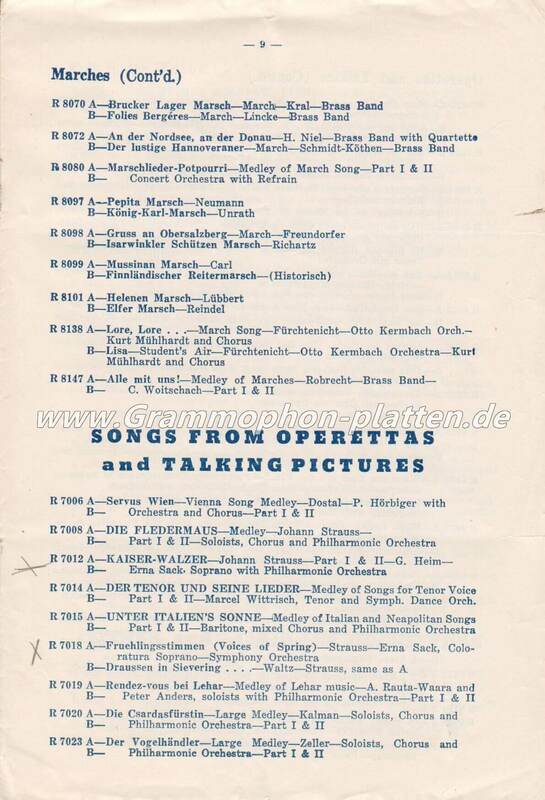 1939 Oettgen recorded the speeches of Fritz Kuhn at Madison Square Garden before more than 20,000 “followers” and visitors on 22 discs (12”). They then appeared on Radiofunken. The Radio Rundfunk is called here as a record company from Yorkville. At the latest after this claim the production of Radiofunken records must have been stopped. Even the furniture store Bolle & Detzel as the main financier no longer exists. Oettgen and his Company’s disappeared around the same time from the yellow pages - and public perception. 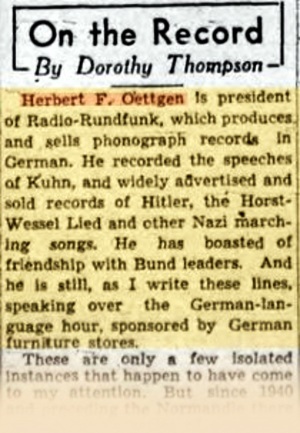 The former director of the Radio Rundfunk Corp. called himself after the war (for some years) Fred Herbert-Oettgen. 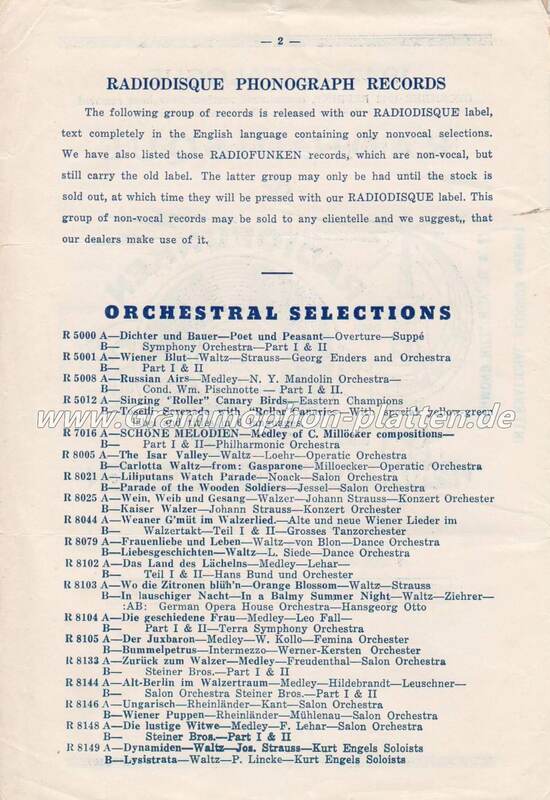 From 1945 on he is mentioned as the technical director or recording manager of the Carl Fischer Studios. 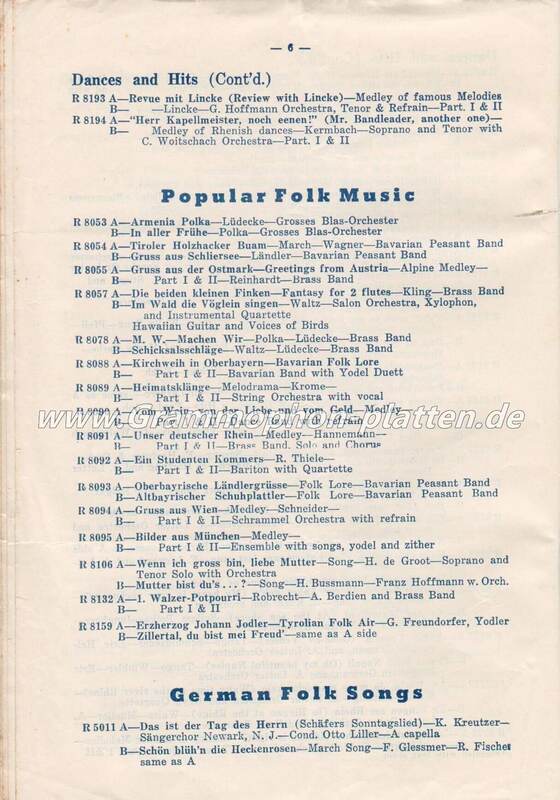 From c. 1946 on we will also see the second edition of the RADIOFUNKEN records. The Europe Import (Importer and Exporter of authentic Swiss yodeling - records ...) is now under the direction of a certain Walter Reuter. The exact company address is (yet) unknown. 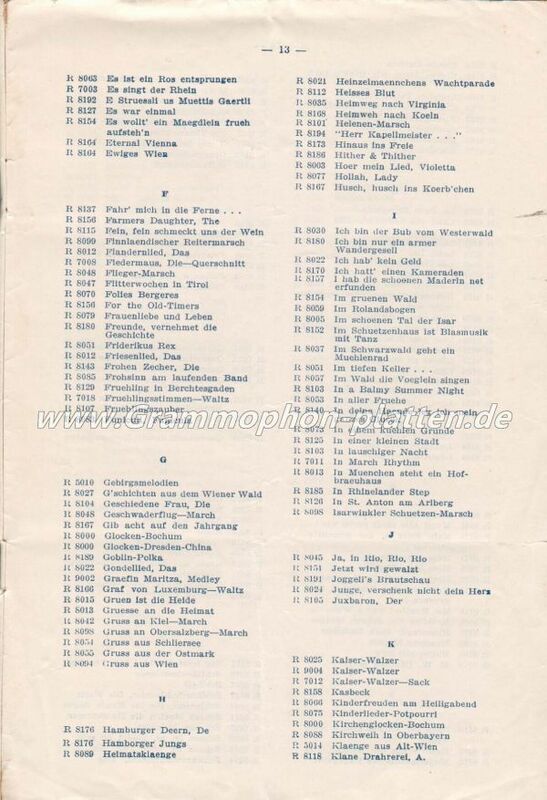 In 1949 Oettgen was divorced from first wife because of "… nonsupport and cruel and inhuman treatment" against her. 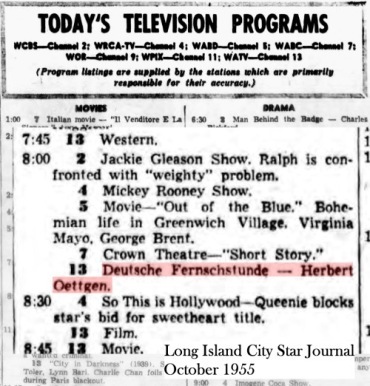 In 1955, he is Moderator of the German Television hour in New York for a few months. 1964 he sold life insurance.